A moose wanders into a pond up to his belly in search of food as he scans the Ontario landscape for any signs of danger. A moose loves to cool off on hot days in Ontario, Canada in a pond or a lake for a quick dip or sometimes for a few hours at a time. Even though a moose is a large animal, it is a extremely strong swimmer that can dive over five meters in search of food at the bottom of a pond or lake. 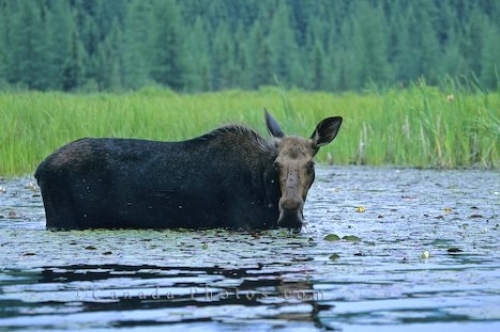 A Moose stands belly deep in a pond in Ontario, Canada, North America. Picture of a moose wading in a pond in the wilderness of Ontario in Canada, North America.